Heading into the 2018 season, five teams -- Greeneville, Augusta, Tampa, Hudson Valley and Gwinnett -- are sporting new looks. It's been a slow baseball offseason -- and not just when it comes to free agent signings. 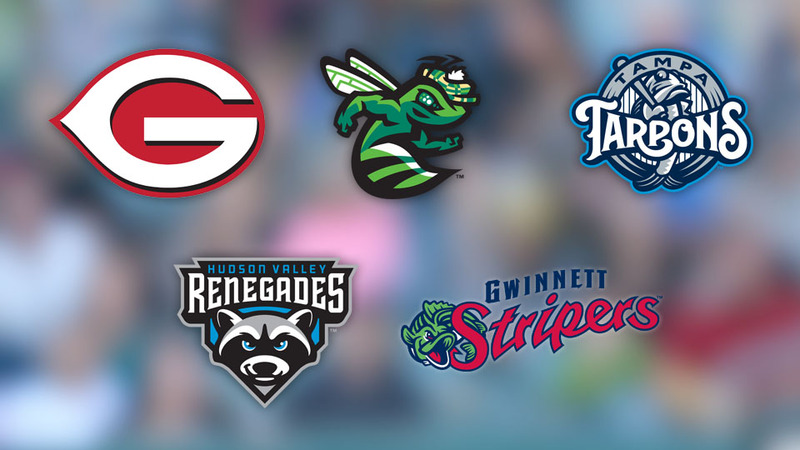 During the 2015-16 offseason, 10 Minor League teams unveiled new identities and/or logos. A year later, nine teams followed suit. But this offseason, that number stands at a relatively modest five teams. With Opening Day on the horizon, here's a review of the newest looks on the Minor League Baseball landscape. No Minor League rebrandings occurred in November, a truly rare happenstance (there were nine November rebrands over the previous two offseasons). The Hudson Valley Renegades were the first team to do an unveiling, premiering a new set of logos designed by Studio Simon. The Renegades kept their raccoon-centric look and blue, black and gray color scheme but made significant changes. The primary logo features Rascal the raccoon sporting an "intense, competitive look with a sly smirk," while an alternate mark features a stunning natural backdrop to accentuate the team's "connection to its home here in the Hudson Valley." He said it: "The Hudson Valley region has been good to us all these years, and we're real excited about this identity." --Renegades president Steve Gliner. The Augusta GreenJackets are moving into a new ballpark this season, crossing state lines in the process (from Augusta, Georgia, to North Augusta, South Carolina). To commemorate this significant step, the Giants' Class A affiliate unveiled new logos. The previous logo featured a bee wearing a green jacket, referencing Augusta's Masters Tournament. Now, the bee itself is green. A golf motif remains, however: the bee is wearing a plaid duffer's cap and its eyes feature golf ball-shaped dimples. He said it: "We went way down the road on a couple of different looks but decided that we need the bug. It all came back to the bug." --Jeff Eiseman, president and partner of the GreenJackets' Agon Sports and Entertainment Group. After nine seasons as the Braves, Gwinnett moved to differentiate itself from the parent club by becoming the Stripers. The name references the striped bass that are plentiful in nearby Lake Lanier; the primary logo, designed by Brandiose, features a determined fish ready to bite into a baseball-baited hook. The selection of the "Stripers" name caught many fans off-guard, since it wasn't among the finalists in Gwinnett's "Name the Team" contest. Stripers president North Johnson explained that Big Mouths, another bass reference, was the initial choice. However, the team came to the realization that Big Mouths "doesn't come out of your mouth easily. It's a mouthful, if you will." The Stripers were unveiled on a Friday. The following Monday, another fishy entity formally entered the Minor League universe. And, as with Gwinnett, Tampa's name change was motivated by a desire to differentiate itself from the parent club (in this case, the Yankees). Tarpons, a popular catch among Florida's sport fishermen, has precedent. From 1957-87, Tampa fielded a Florida State League team with that name. That previous Tarpons incarnation was most often affiliated with the Reds and relocated to Sarasota in 1988. The "new" Tarpons feature the titular fish in an upright position, resting a bat on its shoulder as it stares languidly into the middle distance. He said it: "The goals were to connect with the fans and the community and also the rich history of baseball in Tampa. [The new logo] was very much based on previous iterations, but if the artwork does that while bringing something new, then you're hitting on all cylinders." --Dan Simon, head of design firm Studio Simon. When the Houston Astros decided they no longer wanted to field an Appalachian League team in Greeneville, Tennessee, it provided the opportunity for another organization to swoop in. That organization turned out to be the Reds; Greeneville's Appy League team is now known as the Greeneville Reds (all 10 teams in the league carry the name of their parent clubs). The Greeneville Reds logos, unveiled in January, adhere closely to Cincinnati's. The primary logo features a "G" in the same style as Cincinnati's "C." Local flair can be found via one of the logos, however, which features an anthropomorphic baseball decked out in a coonskin cap. This is a reference to Davy Crockett, who was born and raised in the Greeneville area.